It began with a Sam Adams Zeus IPA at 4:12pm on May 7, 2011. It made the Epic halfway point with a Copperhead Brewery Bourbon Barrel Black Venom with Cocoa Nibs (Batch #001) on September 9, 2015. It reached an Uber proportion on January 13, 2018, just after 6pm, with Just The Beginning Russian Imperial Stout at Bury Me Brewing, in Fort Myers, Florida. If you're a fan of the Untappd beer check-in app, you already know that we're talking about a trek toward a rare and prized status of checking in 10,000 unique beers on the popular beer tracking system. Southwest Florida beer geek Ricky Potts did just that on January 13, 2018. Not only did his check-in unlock the Uber Badge, but he did it with a beer that he and Bury Me Brewing Brewmaster/Co-Owner Bill Vaughn brewed in October especially for the occasion. Last fall, as the magic number 10,000 inched closer, Ricky and Bill started planning and collaborating on a special beer. After talking about beer styles and flavors, they decided to brew a Russian Imperial Stout. In deciding what hops to use, Bill asked Ricky about his travels around the world, and "how many seas he had crossed." Four seas turned into four "C" hops in the beer, said Ricky in an interview with this site. With a desire for a complex, high ABV beer with the possibility of variants and aging, a Russian Imperial Stout "just made sense." 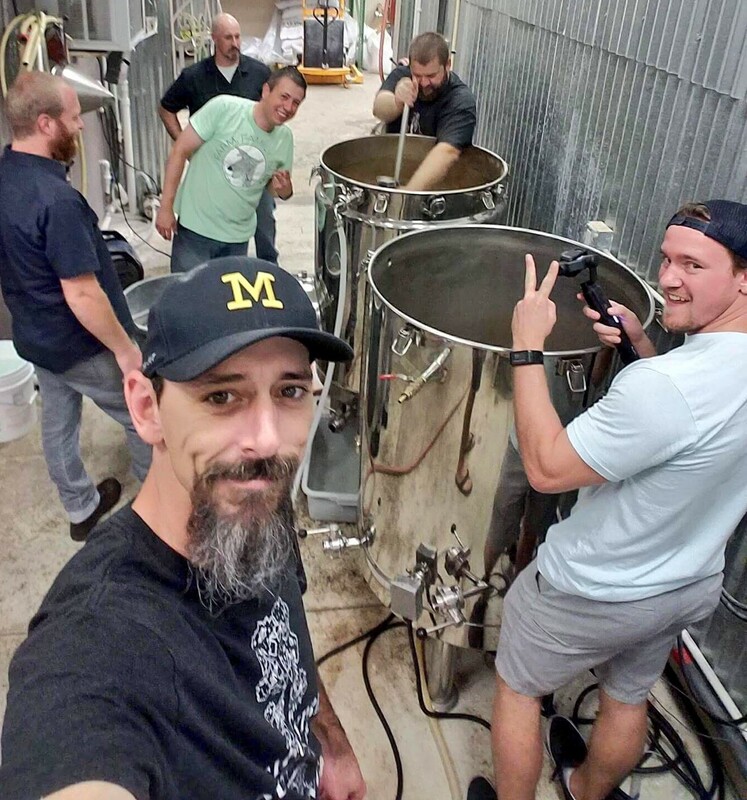 On October 21, 2017, Bill, Ricky and a couple of local area guest brewers brewed the beer, on a day they tabbed as "UberBrewDay." Bill remembers the day well, also, as he overslept and was about an hour late on brew day. Nonetheless, Bill explained in an interview, the crew brewed a three-barrel batch, in an otherwise "normal" brew day, which lasted around 6-7 hours. According to Bill, Bury Me Brewing is "nuts" about honey, so they added half a bucket of honey to make the beer even more unique. In addition to producing a base Russian Imperial Stout as the Uber Badge beer, Bill also made small batches of several variants: Coffee, Vanilla, and Peanut Butter. In addition, there's a barrel of the beer currently resting in a Heaven Hill Distillery bourbon barrel, which is expected to be tapped on January 13, 2019, the one-year anniversary of the Uber check-in. First of all, that's not a misspelling: there's no "e" in Untappd. The popular beer check-in and tracking platform is available as an app on smartphones and an online web version. 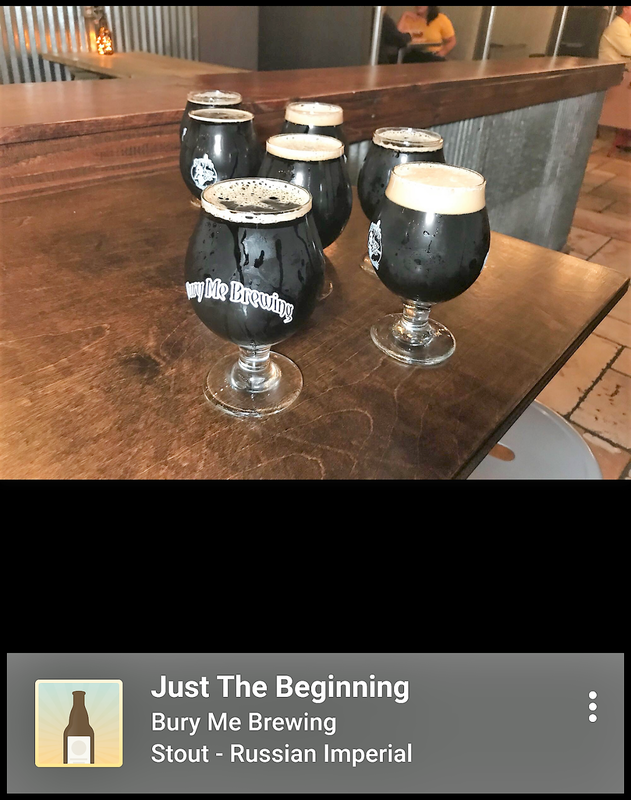 As an Untappd user myself, it's a fun, social way to record beers, beer styles, locations, and to see what others are drinking. 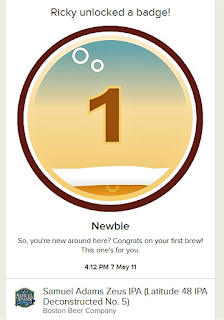 And, yeah, there are those sought-after virtual icons of beer-drinking achievements: Badges. 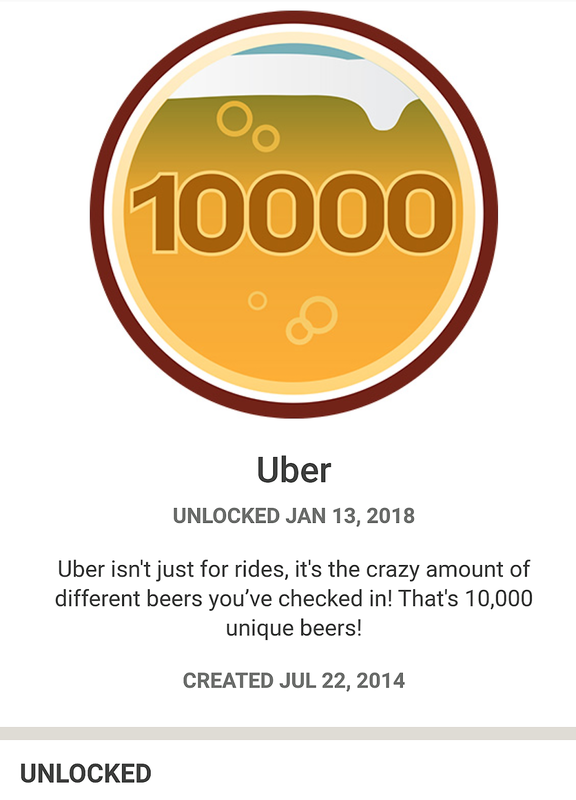 After "checking-in" beers on the app, the system tracks a number of different stats, resulting in awarding of Badges for different activities. 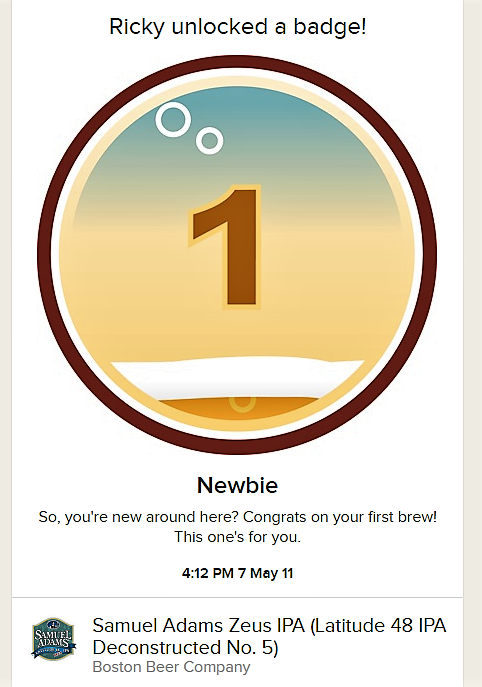 Check-in your first one, and get the automatic "Newbie" badge. After that, a new user can accumulate badges for any number of events, from the "I Believe in IPA" badge for recording IPAs, to the "Epic" unique number 5000 checkin-status, to "Heavy Weight" for drinking porters and stouts, to levels of "New Brew Thursday" check-ins, and just about anything else that a beer drinker does while drinking beer. 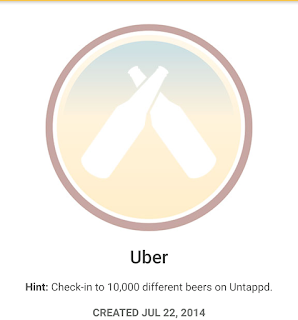 The "numbered" badges, however, only accrue for "unique" beer check-ins, although users can record drinking the same beer more than once. Repeated check-ins to a specific badge category result in "Levels" of the badge. Get that first badge, and it's onward from there! The database is searchable, too, making it a useful resource for not only finding beers, but breweries, and beer establishments. Untappd was founded in 2010 by two developers, Greg Avola and Tim Mather, who connected on Twitter. The two build the app as a hobby while holding their full time jobs on opposite coasts. In 2014, Untappd counted over 1 million users, and it introduced the Untappd for Business and Verified Venues services in 2016. The site's user base has quickly increased, surpassing over 7 million Untappd users this past fall, said Emma Kelley, Untappd Lead Development Representative in an interview. 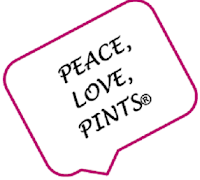 The group is headquartered in Wilmington, NC, which, Emma said, is in a "healthy" craft beer community itself. The Untappd office even has four beers on tap! 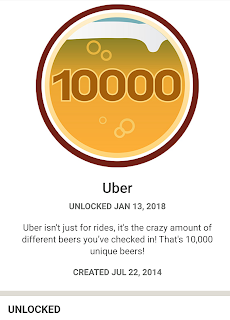 Gotta get to 10,000 Unique Beers to get it! With respect to the elusive 10,000 Uber Badge, figures are not available for how many others have unlocked it, although, according to Emma, less than 1% of the users have reached it. 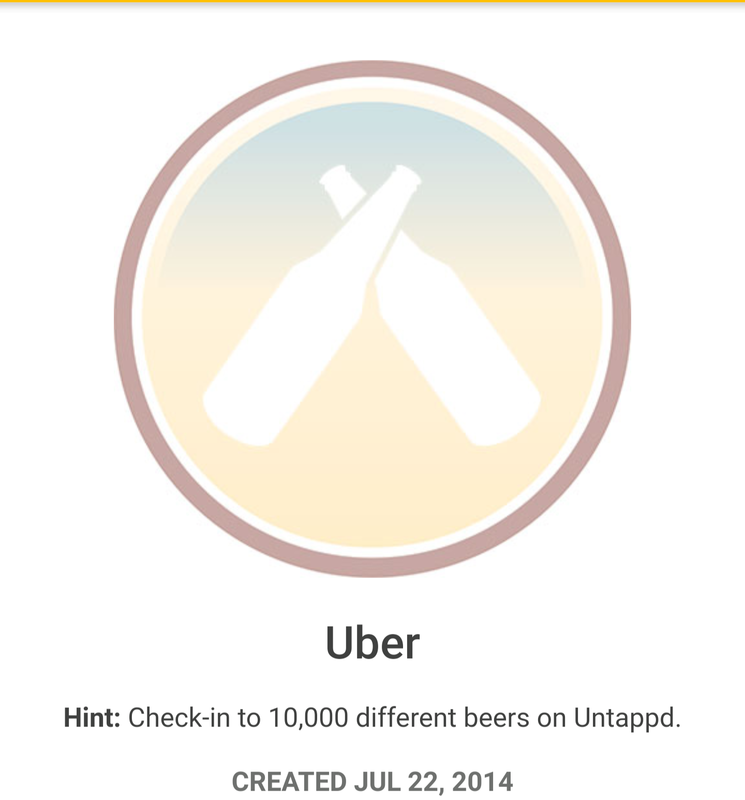 As of now, 10,000 is the highest unique beer check-in number that earns a specific badge. Untappd has branched out from being a beer-geek check-in tool to a business support system, with beer menus and venue and event listings that consumers can reference. 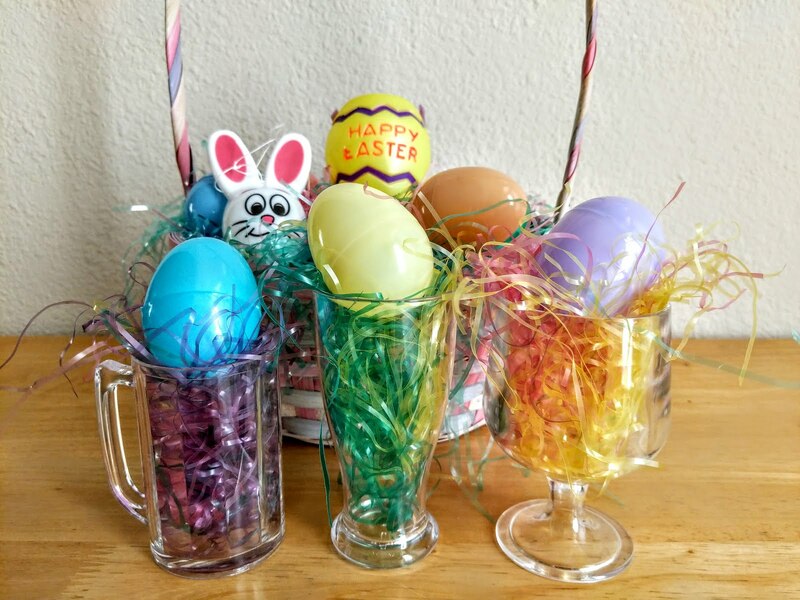 "Untappd for Business grew out of vendor demand," explained Emma. Venues reached out to Untappd asking how they could better connect with patrons. Untappd "realized the value of connecting this huge audience of beer enthusiasts to like-minded businesses," and the Verified Venues tool was born. Untappd features approximately 12,000 Verified Venues currently. 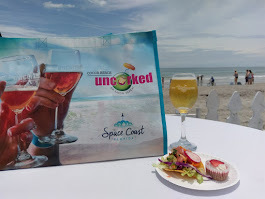 Initially, Untappd for Business focused on menu publishing, added Emma, and it's taken off to become a "business intelligence service," with customer engagement tools, targeted marketing, beer consumption analytics, and more. Consumers can refer to the data when travelling, so they know where to find their next beer! (This writer can attest to that!) 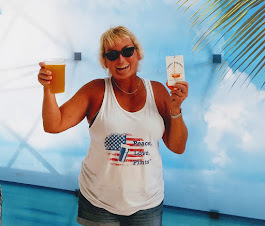 Untappd is continually looking to improve and further the beer industry, and, although Emma declined to dish out any new programs slated for 2018, she hinted to "keep an eye out." If businesses wish to reach out to Untappd about the Verified Venue program, Emma can be reached at ekelley@untappd.com. 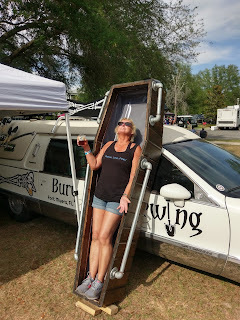 Ricky named the collaboration beer with Bury Me Brewing "Just the Beginning." The name references the "journey" since the time of the first check-in, as well as worldwide travels where he incorporates finding new beers, in addition to playing golf and exploring. The beer check-ins also result from attending beer festivals, visiting local breweries, and beer bars. As stated above, exact figures for the Uber Badge are not available, but Ricky knows three others who have attained it. 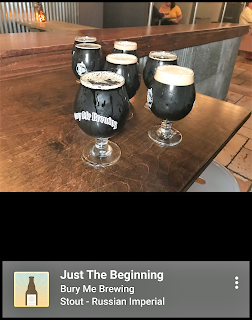 The Untappd app allows for user comments and personal ratings when checking-in beers, and, not surprisingly, Ricky rated "Just the Beginning" five stars. A self-proclaimed "hophead" and "badge collector," Ricky tracks everything (including non-beer related activities), and enjoys seeing changes in his palate over time. He takes an annual European beer trip, and "will go anywhere to drink beer!" Although there may not be a "favorite" beer, other than "the next beer," several stand out, including Sam Adams Utopias, 3 Floyds Vanilla Bean Dark Lord, Lost Abbey Duck Duck Gooze, and Goose Island Bourbon County Rare. Because check-ins on the Untappd app continue to aggregate, he'll continue to track new beers and wait to reach the next level when it's released in the future. 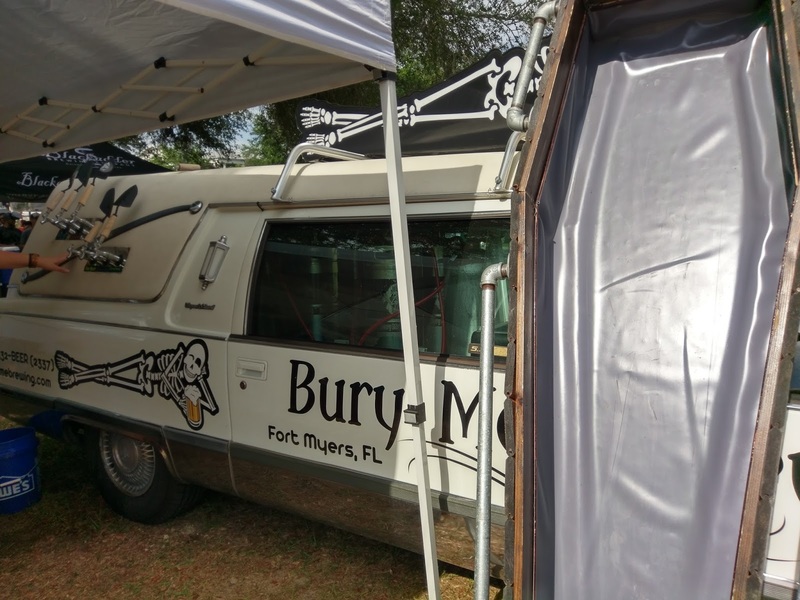 Not only was the base beer tapped at Bury Me Brewing on January 13, but the Coffee, Vanilla and Peanut Butter variants were also tapped at a release party event open to the public. What did Ricky think of those? The Untappd Check-ins show five-star ratings. And, that's not all. Bury Me Brewing also created a special "10K Ricky" Badge, which is open to anyone who drinks the collaboration beer or variants (while supplies last). The brewery opened in May 2015 and brews all styles of beer. 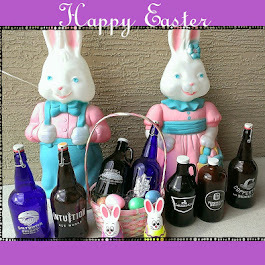 Because the co-owners' palates are "all over the place," said Bill, the brewery strives to be able to brew any style. 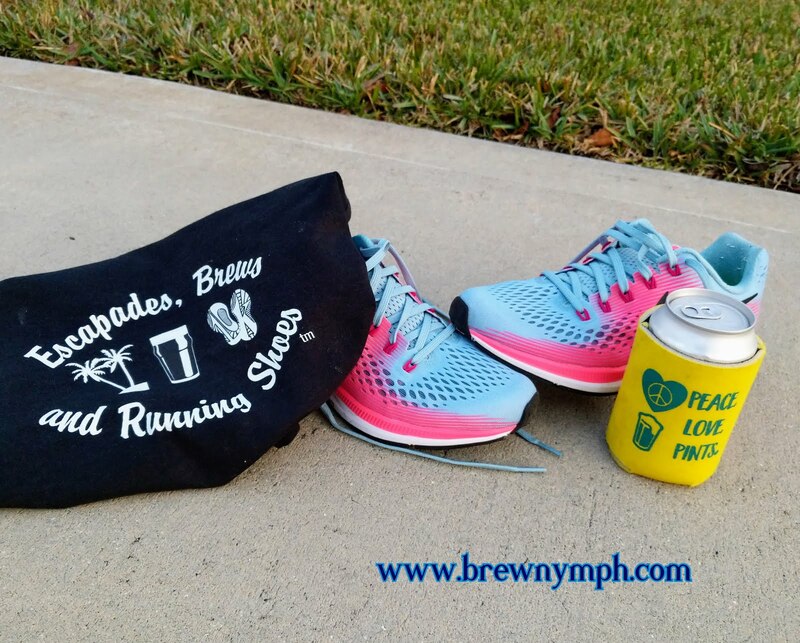 Although consumers appear to be drawn to the brewery's "big, malty" beers, the "From My Cold Dead Hands IPA" is popular in the market and is the brewery's most produced beer. Of course, with a name like "Bury Me Brewing," one can only imagine the beer names: "Creamation" Honey Cream Ale, "6 Ft Down" Oatmeal Stout, "Soulless" Scottish Red Ale, "Bag O' Bones" ESB, and the like. 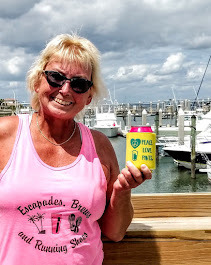 Explained Bill: "Life's too short to settle for lifeless beer," and the concept is all about not taking themselves too seriously. The brewery operates on a three-barrel brewhouse system, with four three-barrel fermenters, four 10-barrel fermenters, and three seven-barrel fermenters. The brewery, which includes a 1200 square foot tap room, is located in a strip mall plaza, a location which it is quickly outgrowing, added Bill. 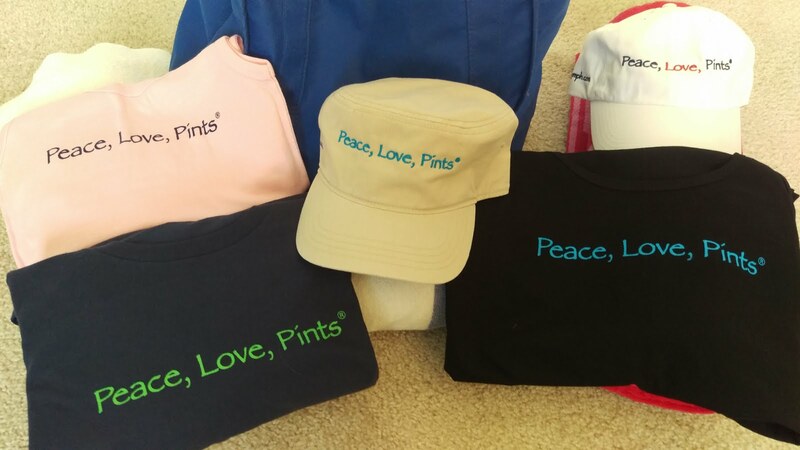 Along those lines, the Bury Me Brewing group is currently working on a new concept in Punta Gorda: stay tuned for Peace River Beer Company in 2018. 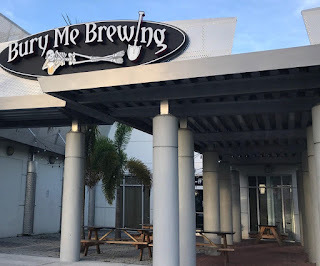 Visit Bury Me Brewing at 4224 Cleveland Ave, Fort Myers. 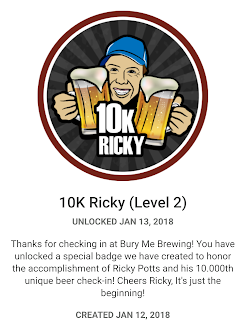 Congrats to Ricky on the 10,000 Uber Untappd Badge! 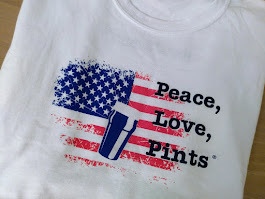 And, thanks to Ricky, Emma from Untappd, and Bill from Bury Me Brewing, for the interviews. If you haven't checked out Untappd, "check-in!" Fun story, and I'm off to add to my Untappd check-ins, although I have just under 2000 to go before I reach the "Epic" 5,000th unique beer. Thanks for reading, and see you with a beer around Florida Somewhere!